November 21, 1965. On this day on the stage of the Moscow Estrada Theatre the premiere of “The Father Frost” by Mikhail Krasev took place. It marked the birth of an absolutely new theatre – the world’s first professional opera, ballet theatre for children. The first 15 years of theatre’s life were difficult, as theatre did not have own premises where the full-scale shows could be staged and performed. But just then artistic and managing concepts of new theatre was formed and a number of performances that won high acclaim from audience were created, among them: “The Snow White” by E.Kalmanovsky, “The Boy Giant” by T.Khrennikov, “The Sisters” by D.Kabalevsky, “Three Fat Men” by V.Rubin, “Little Red Cap” by M.Rauhverger, “Southpaw” by A.Alexandrov, “The Jungle Book” by S.Chalaev and many others. Most of productions have been commissioned by the contemporary Russian composers especially for the theatre. At the same period theatre troupe – opera soloists and musicians, graduates in higher esteemed musical and theatre establishments of Russia – was formed. The ballet company originally started as a group of 7 dancers who supplemented opera performances with dance routines and grown to become a full-scale ballet company around 1975. Already then theatre enjoyed huge success both at home and abroad, and had delighted audiences all across Europe (Austria, Hungaria, France, Italy, Yugoslavia) as well as in the USA, Canada and Japan. The enthusiastic response to the company’s work in its ever-growing audience pointed to the need for a large performance space. The old building could only accommodate an audience of 300 and those wishing to see the shows numbered in the thousand. 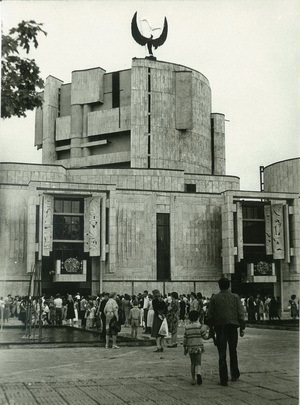 In late 1979 – year, proclaimed by UNESCO as the International Year of the Child, the construction of the theatre building was completed and the theatre was given a fitting home in its present location, a purpose-built space with two stages. A Blue Bird of Happiness on a golden harp - a symbol of the theatre – hovers over it. The building was designed by a team of architects headed by A.Velikanov and V. Krasilnikov and with the ongoing participation of Natalia Sats as the adviser. A new era for the theatre was ushered in by the premiere of Giacomo Puccini’s opera ”Madama Butterfly” staged by Natalia Sats. The new building breathed new life into ballet company as well and the theatre repertoire was enriched with the legendary ballet ”The Blue Bird” by Ilya Sats and Mikhail Raukhverger choreographed by Boris Lyapaev. Theatre always tried to present the classics to children. Following ”Madama Butterfly” production theatre presented ”The Magic Flute” by Mozart, ”Cinderella” by Prokofiev, and Prokofiev’s famous symphonic fairy tale ”Peter and the Wolf” narrated by Natalia Sats – a work written by Prokofiev on Natalia Sats’ request and in collaboration with her and aimed to acquaint children with the various musical instruments, which make up a symphony orchestra. After Natalia Sats death in 1993 the company went through a difficult time, but it survived, kept its audience and upheld its creative standards. A number of shows for both Main and Small stages was created: ”Thumbelina” and ”Lord of the Flies” by E.Podgaits, ”The Snow Queen” by A.Flyarkovsky, ”The Twelve Months” by S.Banevich, ”L’enfant et les sortileges” by Maurice Ravel, ”Eugene Onegin” by P.Tchaikovsky, ”The Little Mermaid” by T.Kamasheva, ”Marriage” by A.Grechaninov, ”The Wizard of the Emerald City” by I.Yakushenko and many others. Indeed a new chapter in the theatre’s life began in 2010 when Georgiy Isaakyan – State Prize of the Russian Federation Laureate and Golden Mask Prize Laureate – became Artistic Director. The philosophy behind his artistic renovation is to introduce a programme diverse enough to accommodate the classic greats as well as the contemporary, to introduce children and teenagers to the top aspects of Russian and world culture. The repertoire reflects this aim and during last seasons a bunch of operas and ballets by Prokofiev and Shostakovich, Stravinsky and Ravel, Janacek and Stockhausen, Emilio De Cavalieri and Handel, Bizet and Rimsky-Korsakov appeared in the playbill. In 2015 company celebrated its fiftieth birthday. During 2 days of the “Open House Days” theatre attracted an absolutely record number of visitors – over 4000 spectators attended events carried out in the framework of birthday celebration: workshops, guided tours of the theatre, master-classes where children had a possibility to try themselves as props men, make-up artists, costume, set and light designers, quests games and discussions of theatre and its relevance today. On November 21, 2015, on the same day but five decades later, theatre premiered a new version of Mikhail Krasev’s opera ”The Father Frost” – performance, which gave a start to our theatre 50 years ago.